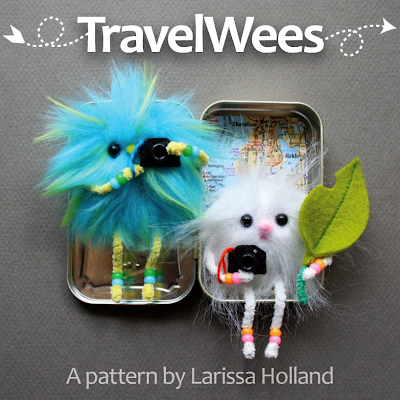 The new TravelWees pattern is now available in my Craftsy store for instant download. It will be in the Etsy shop too, just not until the first part of July. 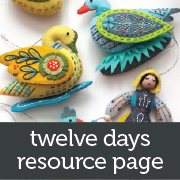 It is now available via email delivery in my Etsy shop too! Did you notice these TravelWees look a lot like my Travel Bugs? Yes, I renamed them because there is a cool geocaching dogtag on the market with the same name. I like the name TravelWee better anyway! It makes them seem maybe Scottish. That blue one looks like he could be a Nac Mac Feegle. 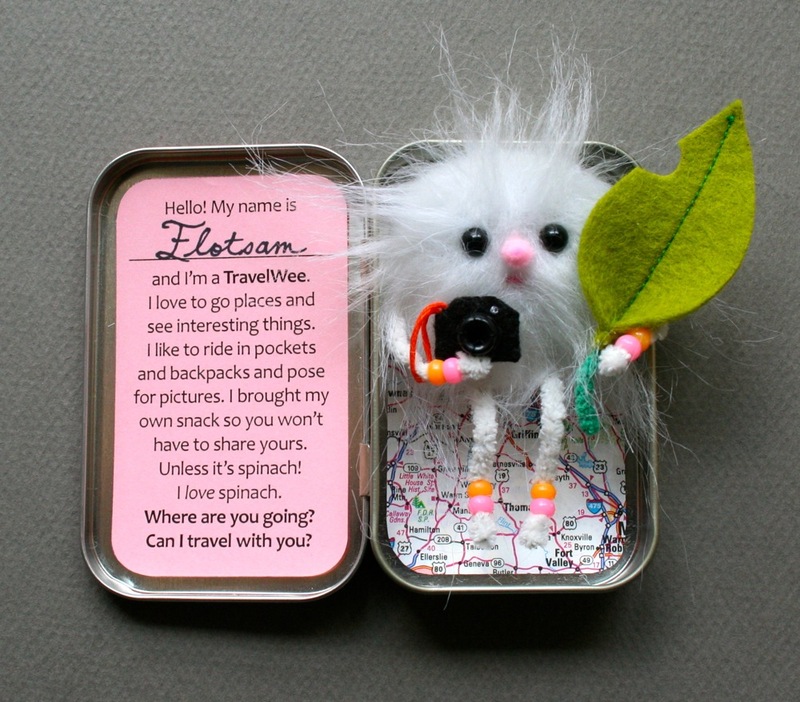 The pattern includes instructions to make what you see, including the poseable TravelWee doll, teeny tiny camera with strap, salad-to-go, and tin liner. It also includes a printable tag for the inside of the tin lid. All designed to fit inside an Altoids® Curiously Strong Mints tin, so young travelers can stow them in pockets and backpacks. This pattern is for a toy with very small parts and may pose a choking hazard. 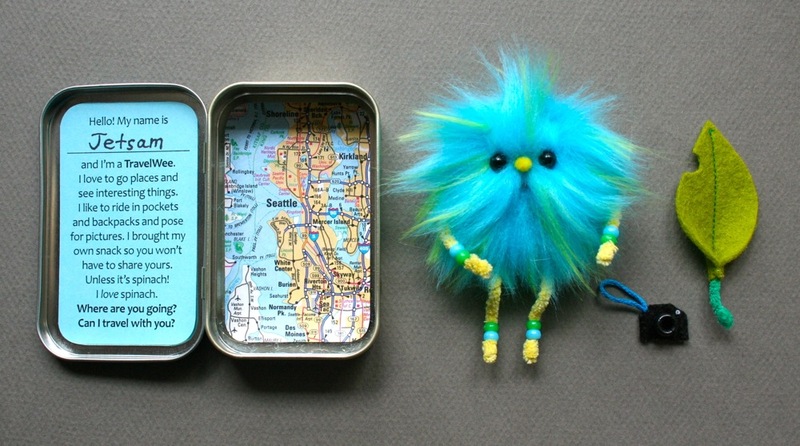 I would not recommend making it for any globe trotter who is under the age of three. You can make them seem more girly or more manly depending on the color and thickness of the synthetic shag fur you use. It is pretty fun to style their hair. Jetsam's bright blue hair is very thick, and Flotsam's hair is more wispy. I recommend using cotton pipe cleaners for their arms and legs. They are available at cigar/pipe shops and also online. They are so soft, have a shorter nap, and seem to be stronger than regular craft pipe cleaners. 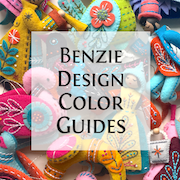 Though admittedly the color choice is more limited. I did manage to snag a box of IDEAL rainbow assortment off of ebay. But there's always white! 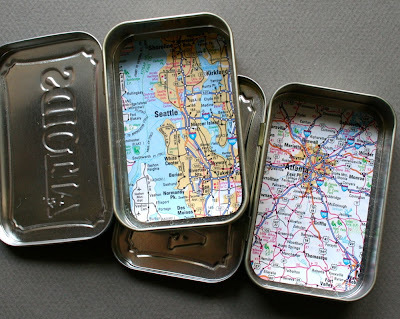 You can use an old map or road atlas to line the Altoid tin. Maybe your hometown or destination city. If you don't have any recyclable maps, decorative paper is also an option. 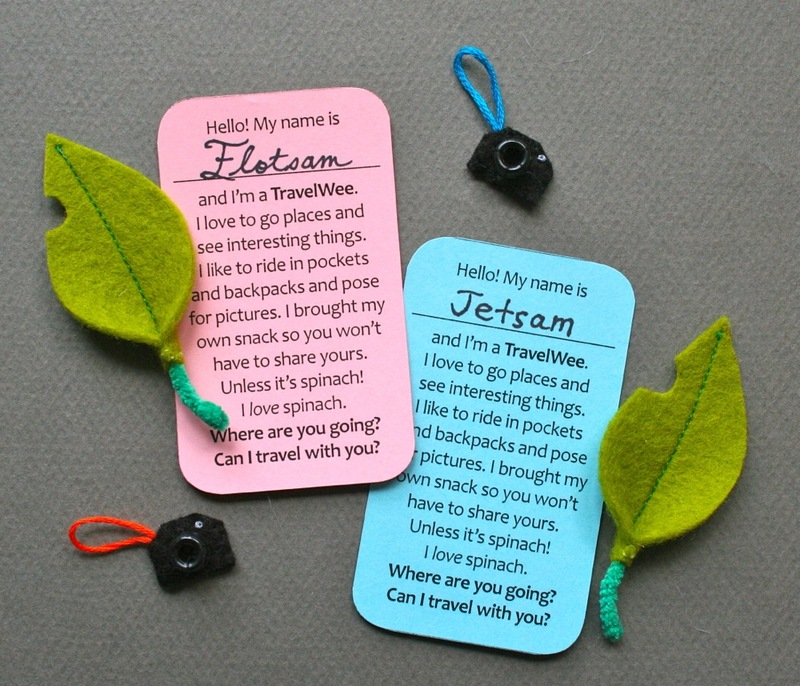 Here's a closeup of the printable tags, leaves and cameras. I'd love to get shots of TravelWees in exotic locales. I hope you enjoy the pattern! 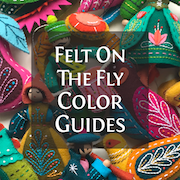 Thanks so much for sharing this pattern with us! I've been looking forward to it every day since you said you were working on it. It looks amazing! Curiosity got to me, and I had to do a little searching and learned a lot about 'the other' Travel Bugs... interesting! Oh my! So cute and so much personality! l love them so much! 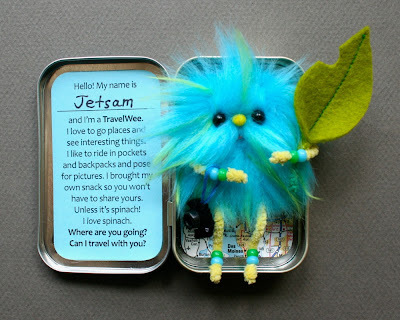 Flotsam & Jetsam, I love it...have you been reading The Borrowers? These are definitely on the list to make for the next road trip. Thanks! Oh they are wonderful! What a great way to bring even more excitement to a journey to a new location!! Robyn, good thing you have your big one. One by the big statue would be great. Can you have Robert Pattison in there too? Looking really tortured. Y'all, thanks for your enthusiasm! So glad you like them. Candy, made me want to buy a Travel Bug and give it to some stranger at the airport and have them give it to another stranger at an airport and so on and so on. Just to see where it ended up. Ann, no haven't been reading the Borrowers. Should I be? I'll look it up! 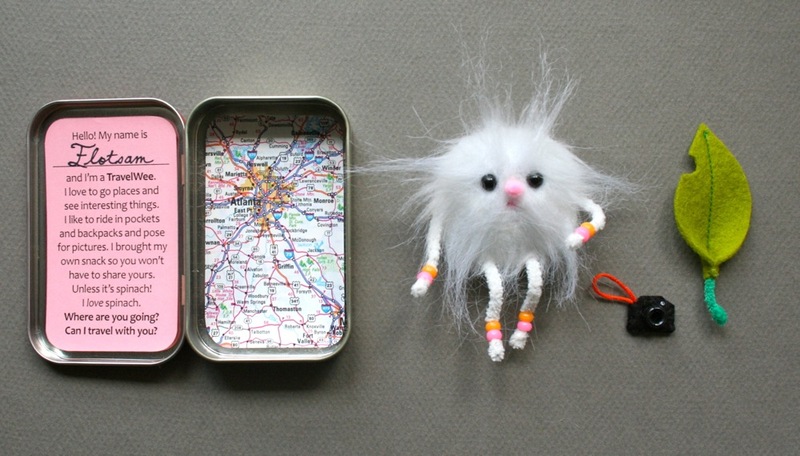 Travel Wees are cute little fellows to come along on a trip. This is one of the cutest things I have EVER seen! Such a great idea! My little boy goes on a father/son camping trip next week- I think he needs a little mate for the trip! Just wanted to share with you all the amazing Wees the girls came up with the day we made them. Your project was a huge success - even though we didn't follow your instructions to a T! Thank you!!! I left you a message on facebook. 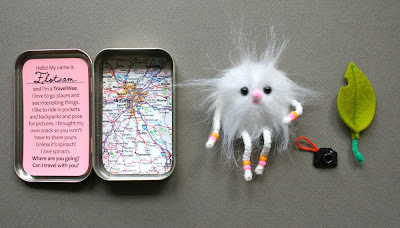 Your TravelWees are very cute. Christel, oh my stars those are so cute! I especially love all the tiny accessories they came up with! The guitar! the balloon! Thanks for sharing. So I did a test drive of the Wee pattern today and am thrilled. He is pretty adorable. When all was said and done I realized I skipped the step to tack his arms/legs into place. Just curious...was glue alone not enough? Hoping this little guy stays intact without his stitches. Second question...did you try stitching mouth before putting the pieces together? Seems it would work. Hmmmm, I figure you tested it and there is some good reason. Now to dress up my tin. Scored a bagful at a garage sale for FREE so this could become a real addiction. Thanks so much for offering up the idea for this little cutie! BchRatz, I certainly hope I got back to you via email. I never tried it with just glue, but I figured the arms and legs would get a good bit of tugging and positioning, so it would be better to tack them in place. I preferred to make the mouth afterward because the expression changes when you stuff them, but I'm super picky about that. You could totally do it before you sew him together. Thanks a bunch for the great feedback, and *score* on the bag of tins!